I’m just waiting to see if you’re going to make a pink floyd wall reference for Buck Stars. I guess I wont, or well, maybe we can count the shaking guy as Pink, since he looks like him near the end of the movie. Conociendo estos tipos, las posibilidades no solo son infinitas, sino aterrorizantes. 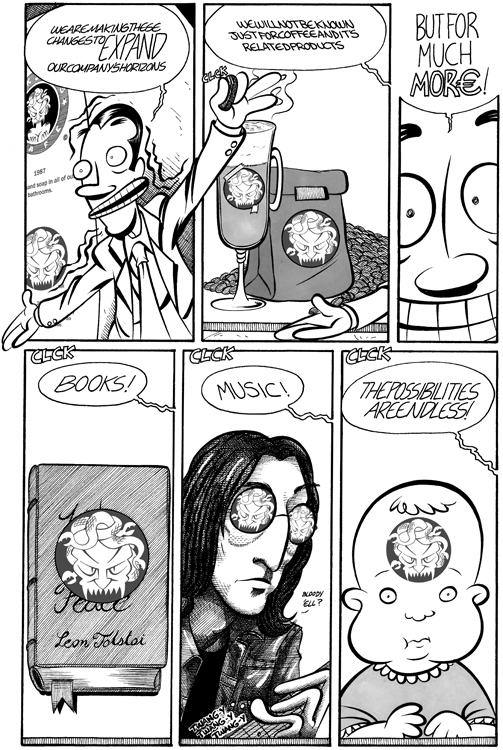 Love the Lennon like picture/panel! Unless they make robot toys to fund their evil, I mean, benevolent company, I ain’t interested! They might take you up on that. Nope… well, not yet (the Slim part, they do want the world). All your noodles belong to us. aw, i was half expecting mind-controlling genetically modified coffee, but this is far more evil.